House of Secrets #109 COVER Original BRONZE Comic Art Nick Cardy 20c DC Horror. 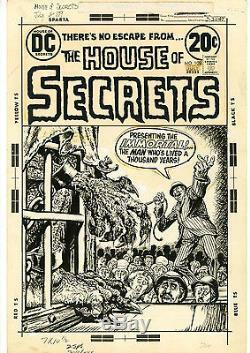 This original hand drawn comic art by Nick Cardy is the cover from the House of Secrets, issue 109. This is a great 1970s horror cover. We take pride in packing all the orders we receive carefully. THIS IS NOT WHAT WE DO.... All orders, no matter what the price of the item, gets boutique professional packing treatment. The item "House of Secrets #109 COVER Original BRONZE Comic Art Nick Cardy 20c DC Horror" is in sale since Sunday, July 31, 2016. This item is in the category "Collectibles\Comics\Original Comic Art\Covers". The seller is "sparklecitycomics" and is located in Middletown, New York. This item can be shipped worldwide.